In northern New England, spring always drags her pretty heels until suddenly she bursts upon us in all her glory. This year, however, the burst seems to have come at lightening speed. Here is the picture I took on Monday, April 3, to toast my blog-friends Derrick and Jackie. Here is a picture I took on Wednesday, April 19, a little over two weeks later. Even by Maine standards this is fast, fast, fast, and I just can’t get over the velocity with which spring has come this year. 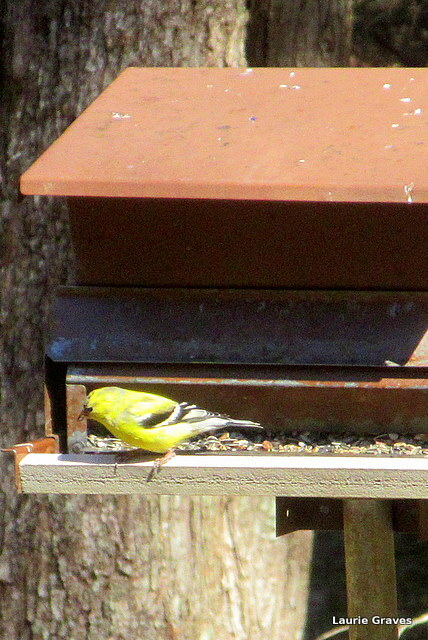 The male goldfinches have begun to turn bright yellow, the phoebes are singing their “fee-bee, fee-bee” song, and my perennials are poking their bright green leaves up from the cold dirt. Tra-la, tra-la! Spring is here, and even though yesterday and today have been chilly and rainy, I know that winter is firmly behind us. Time to remove the leaves from the front garden beds (me). Time to rake the yard and clean up the sand by the edge of the road (Clif). 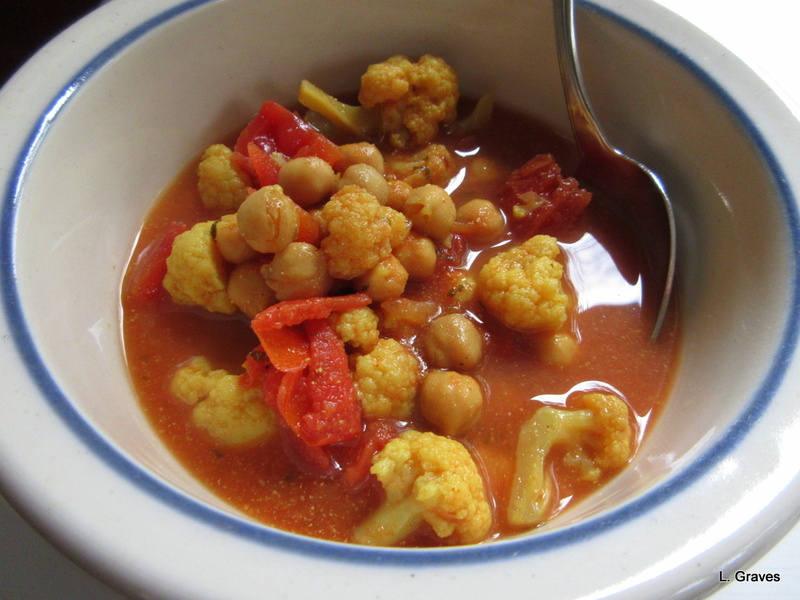 Because of the chilly weather—very common in Maine in the spring—for supper last night I had soup in mind, specifically a curried chickpea and cauliflower soup. I poked around the Internet, and using suggestions from various recipes, I came up with the easiest, tastiest soup I have ever made. And I mean ever. This is chiefly due to using cans of diced tomatoes with green chilies. Spiced with onion and garlic as well as green chilies, these canned tomatoes are so flavorful that they make an excellent albeit spicy base for a soup, and no additional onion or garlic are required. Add chickpeas, cauliflower, and a few other spices. Let the soup bubble and violà! 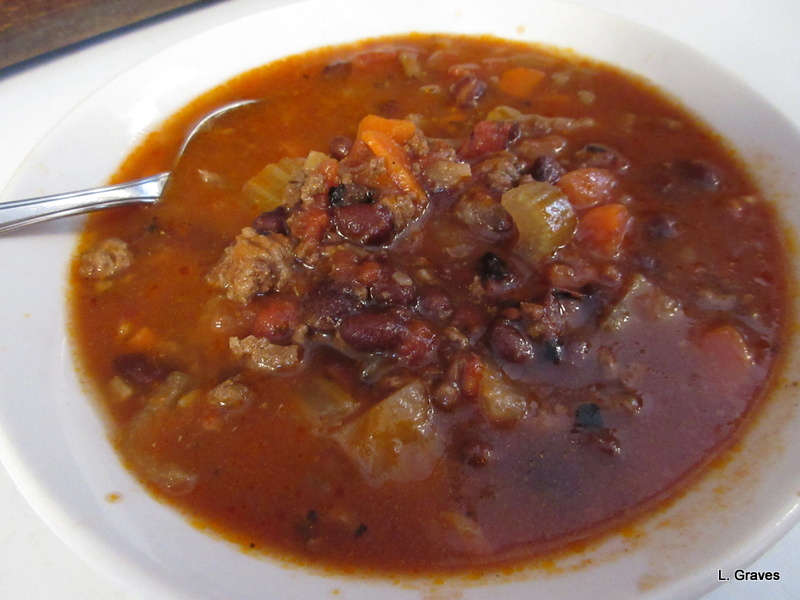 You will have a spicy, satisfying soup for a cool spring day. Broiled toast with olive oil and grated cheese makes a fine accompaniment. In fact, who could ask for anything more? Put all the ingredients into a slow-cooker. Cook on high for three or four hours. On low for about eight hours. When the cauliflower is tender, the soup is done. Near the end, add the splash of milk—coconut would be lovely—but this is optional. See what I mean about this being the easiest soup ever? Lately, Clif and I have been talking about improving our diet. We are, ahem, at that age when the body needs all the help it can get. It’s not that we don’t eat well—we eat a fair amount of fruit and vegetables—but our diet is definitely heavy on the carb side. So, we decided to ramp up the vegetables and replace white bread and wraps with whole wheat. On the weekend, we’ll allow our selves some treats. After all, this is a marathon, not a sprint. As always, further studies are needed to confirm the results, but how can you go wrong eating more fruit and veggies? And, to round out the coincidences, a day or two before I read the article, I made a vegetable and bean soup that includes carrots, celery, cabbage, tomatoes, and black beans. I’m not sure if a big bowl would tick off five servings of veggies—beans count, too—but it must come pretty darned close. This soup has other benefits as well. It is not expensive to make, even if you use organic ingredients, and everything can be tossed into a slow-cooker, where the soup will simmer away, filling the whole house with a delightful smell. Best of all, as my Yankee husband put it, the soup is pretty darned good. A word of warning about the following recipe: As is my habit, I did not make this soup following a particular recipe. I just added ingredients as I saw fit. Soup is very forgiving this way. Therefore, much of what I’m suggesting will be guidelines. Feel free to experiment with the ingredients and the spices. In the end, you will have wonderful, nutritious soup, and you will be well on your way to fulfilling your ten-a-day requirement of fruit and veggies. 1 (1/2) cans of water—using the can from the fire roasted tomatoes. Add more water if you want a thinner soup. Cook and brown the ground turkey in a large skillet. Put the cooked turkey in a slow-cooker. Cook on low for nine or ten hours; high for five or six hours. 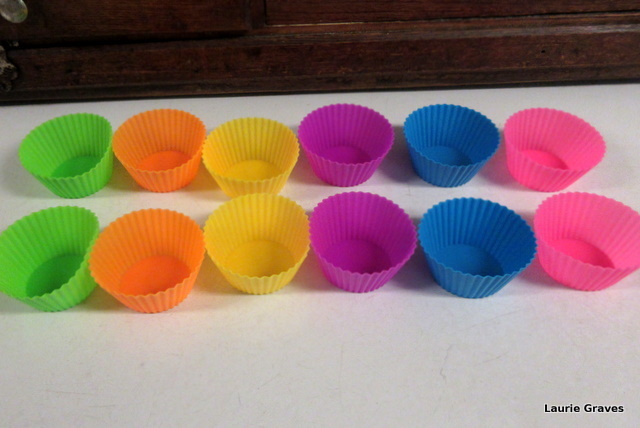 The day before yesterday, our friend Diane surprised us with a gift of twelve silicone muffin cups. Thanks so much, Diane! 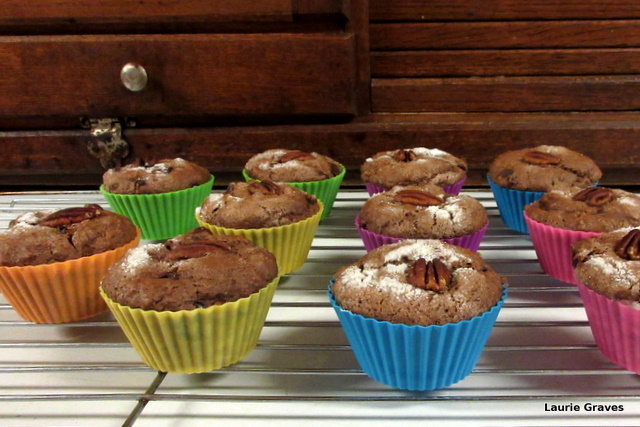 Naturally I had to immediately try them out, and at Clif’s insistence, I made cocoa muffins, which are really a dessert but with less fat and sugar than a cupcake. 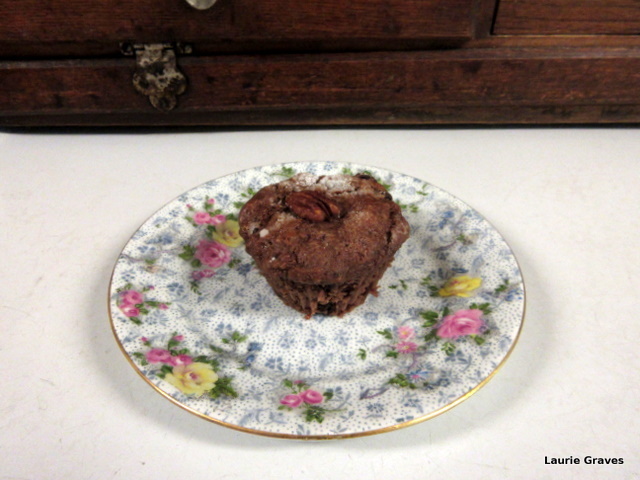 To guild the lily, I added three-quarters of a cup of chocolate chip, placed half a pecan on each muffin, and sprinkled the tops with a bit of sugar. The results? “Pretty darned good,” Clif said. And best of all, there was hardly any sticking. I let the muffins cool and peeled away the silicone cups. Voilà! Perfect little muffins with no bottoms left behind. Combine dry ingredients in medium-size bowl and set aside. In a large bowl, lightly beat the egg. Beat the vegetable oil and milk into the egg. Sift dry ingredients into the wet mixture. Stir just until the ingredients are mixed. Do not overstir or muffins will be tough. Place pecan half on top. Sprinkle the tops with sugar. If using a traditional muffin tin, let cool for five minutes before removing muffins. If using the silicone cups, let the muffins cool completely before removing from the cups. Butter, of course, goes with any kind of muffin, but berry jam tastes pretty darned good with these muffins, too. Being a foodie, I love cuisines from many cultures, but one of my favorites is Mediterranean food. To my way of thinking, basil, olive oil, and garlic form a holy trinity, and in my little herb garden, I am happy to report that my basil that is growing very well. I also love sage, oregano, rosemary, lemons, feta, olives, and artichoke hearts. I get positively dreamy over the thought of going to Italy or southern France or Greece and eating the glorious food. Therefore, when my friend Jill told me she was bringing artichoke dip for our Fourth of July gathering, I could have jumped for joy, if my creaky knees had allowed me to do so. I have never met an artichoke dip I haven’t adored. With spinach, with cream cheese, with crab—it’s all good. 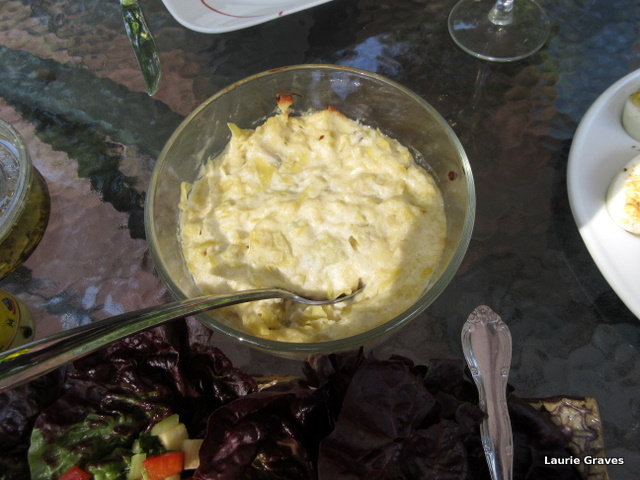 However, Jill’s artichoke dip, made from a recipe given to her by her mother, is one of the best of I’ve ever had—smooth, creamy, a little garlicky, with bits of chopped artichoke hearts. I could have some right now, and I will be making this dip to bring to an upcoming appetizer night we’ve been invited to. Jill has graciously allowed me to post the recipe. It can be served with carrots or other raw vegetables, crackers, or toasted pita bread brushed with olive oil. And on a warm summer’s night, as you are drinking wine and eating this dip, you can pretend you are in the Mediterranean, where the sky and the sea are bright blue and the food is oh so good. Jill’s luscious artichoke dip next to Alice’s beautiful salad. Spread onto bottom of 1 quart oven-safe serving dish. Bake 20 to 25 minutes or until lightly browned. Serve with rye bread, pita chips, or fresh vegetables. Spring is a fitful affair in Maine. After a nice spell of sunny weather, the past week has been gray and chilly with intermittent rain. Between rain showers, I did manage to clear the leaves from my flower beds. Now, weather permitting, it’s on to rearranging, fertilizing, and adding compost. And planting flowers, which I love best of all. Today—another gray day—our friends Judy and Paul are coming over for banana bread, tea, and talk. I’ll put out my flowered placemats, but not too soon as I know the cats will decide clean mats are the perfect place to nap. (I hate, hate, hate having the cats on our dining room table, but they sneak onto it every chance they get.) Not many flowers are up in the garden, but I’m hoping to make a small bouquet of pansies and hyacinths. It’s a funny thing about banana bread. I usually only make it when the bananas are so far gone that I don’t even want them sliced in my cereal never mind eaten as is. In that sense, banana bread almost seems like a consolation prize, something you never make just because you want the bread but rather because you don’t want the bananas thrown out. It hardly seems fair, then, to relegate banana bread to something you only make when the bananas have gone mushy. A bread that tasty deserves respect. But life is like that, and good things don’t always get the respect they deserve. 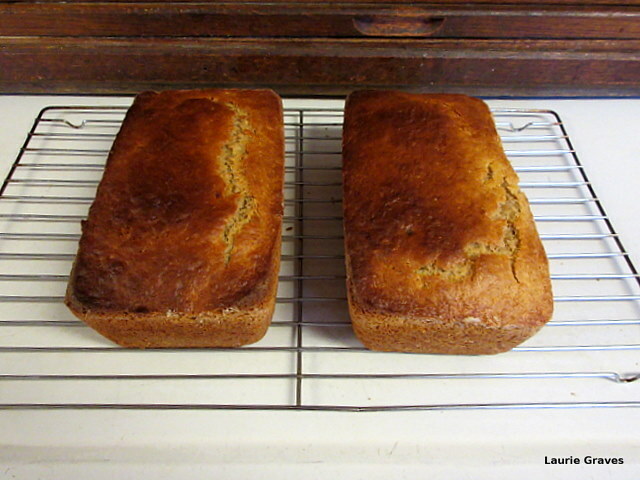 The banana bread I make is a basic recipe that I’ve adapted from good old Betty Crocker. However, I add an ingredient—cinnamon—that is not usually found in banana bread, and I believe it is this addition that makes my bread a teensy-weensy bit better than average. My husband Clif believes that unless banana bread is very fresh, it is best toasted, and I must admit he has a point. Toasting adds a nice crunch as well as providing a warm surface for the butter to melt. Heat oven to 350°. Grease and flour a loaf pan. In a medium mixing bowl, combine four, baking powder, salt, and cinnamon and stir well. In a large mixing bowl, add the egg and whisk well. Add the milk, vegetable oil, mashed bananas, and sugar. Stir until it is well mixed. Add the dry ingredients to the egg mixture and stir—about a minute—until the batter is well mixed. Pour batter into greased and floured loaf pan. Bake 55 or 65 minutes or until a wooden pick comes out clean when inserted in the center. Let the bread set in the pan for at least 5 minutes before removing it. Serve with butter or cream cheese and be sure to appreciate this unassuming bread that can be tucked in the freezer when the loaf has cooled and be there whenever you need it. In Maine, spring seems to have taken a leave of absence. 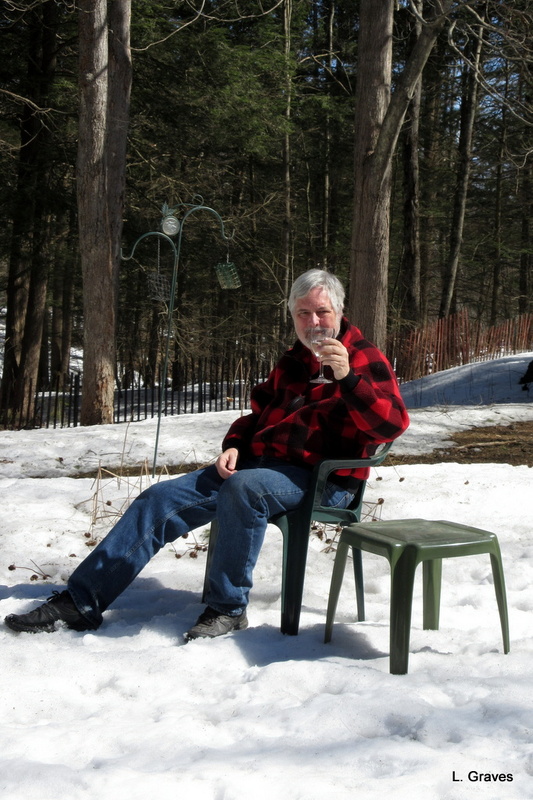 The relatively warm days of late March have given way to some pretty brisk weather, and indeed my blog friends in New Hampshire and Massachusetts have gotten three to six inches of snow. Oddly enough, in central Maine, we only got a frizzing of snow. Nevertheless, yesterday I found that the dog’s outside water dish had frozen solid. A chill wind blew through the backyard, and above the bird feeder, the birds on the branches swayed back and forth. A good thing, then, that the yellow of the male goldfinches is becoming ever brighter, a welcome flash in a landscape that is still lacking color. In the face of such cold weather, what to do, what to do? Why, make squash soup. In a basket in a back room, I had several of Farmer Kev’s squashes that had made it through the winter. Two were butternuts, in perfect condition. My, what good keepers that squash is. Better still, as far as squash goes, a butternut is relatively easy to cut and peel, and it only has a small pocket of seeds to clean. In no time, one of Farmer Kev’s butternuts was cut in chunks and simmering with potatoes, carrots, onion, garlic, spices, and chicken broth. The whole house was fragrant with the smell of bubbling soup. After the vegetables had simmered for an hour or so and were really, really soft, Clif took out the trusty immersion blender—surely one of a home cook’s best friends—and puréed everything so that the soup was lovely and thick and smooth. Now, with the addition of, say, homemade croutons or oyster crackers or toasted squash seeds, that smooth soup would have been good as is. But Clif is the kind of guy who likes soup to have ingredients, so into the puréed mixture I added browned chicken sausage, cooked white beans, and sautéed mushrooms and let everything simmer for fifteen or twenty minutes.. 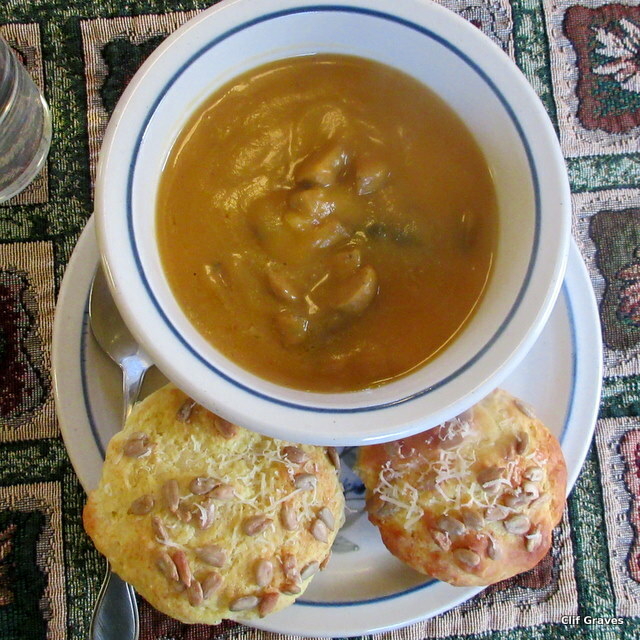 I also made cheese muffins to go with the soup, but that is a recipe for another week. There you have it—a puréed soup that is good enough on its own. Never did I expect to hear this assessment coming from my husband, who has been known to add so many Saltines to his bowl that the whole mess looks like cracker soup. So to add ingredients to the puréed soup or not to add? Optional: beans, mushrooms, sausage, chicken or whatever cooked addition seems good to add to the soup after it has been puréed. In a large stockpot, heat a tablespoon or two of oil and add onions, sautéing until they are soft. Add the squash, carrots, and potatoes and sauté a few minutes with the onions. Add the garlic and sauté for a minute. Pour in the chicken broth or water and stir. Add the spices and let the mixture simmer for at least an hour, until the vegetables are very, very soft. Purée the mixture with a blender, and I strongly recommend an immersion blender. Do put the pot in the sink if you use an immersion blender. You will save yourself a lot of mess. Add other cooked ingredients, if so desired, and simmer for 20 minutes or so. Before eating this flavorful soup, give thanks for squash and for spring, whenever it may come. On Tuesday, our friends Judy and Paul came over for muffins, tea, and talk. We discussed many things but one topic was the movie The Big Short, which is about the 2008 financial crisis and the bursting of the U.S. housing bubble. This utterly engaging and creative movie is now available on DVD, and I think it should be required viewing for everyone over sixteen. Make that fifteen. Only a few people saw the financial crisis coming, and some of these people are profiled in the movie. However, a few years before the fall, some of us could see that housing prices had become so high that average folks simply could not afford them. And despite the drop in prices that came about after the Great Recession, houses are still too expensive for many people. A couple of years ago, I remember walking with my daughter in her South Portland neighborhood, and we passed a cute little Cape that was for sale. “Son of a biscuit!” I said, or something to that effect. The house was sweet and well cared for. It was also what I would call a “bread and butter” house, an average little home perfect for a family just starting out. Nice but modest and nothing special. Certainly not special enough to warrant such a high price. “How can average people afford such prices?” I asked. 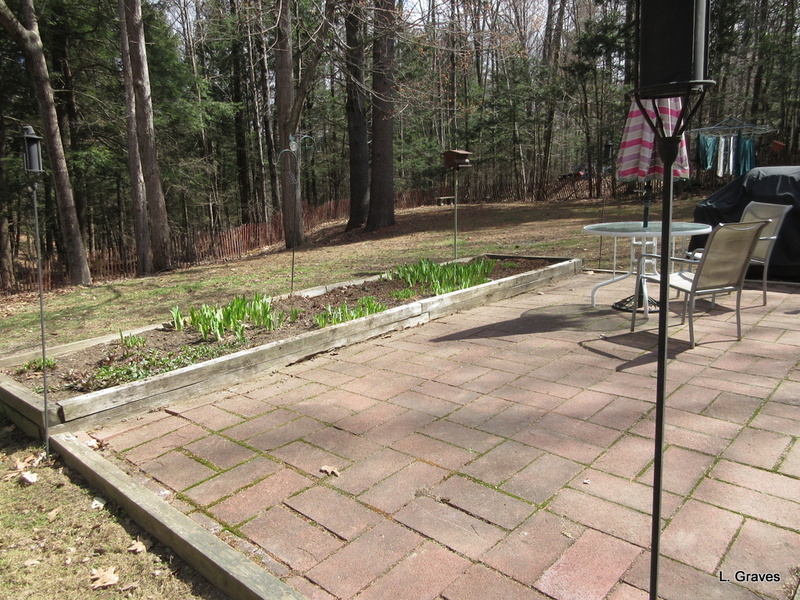 But even in Gorham, a town outside Portland, a modest but well-kept home with three bedrooms starts at $200,000. (In central Maine, where I live, it’s about $150,000.) Now, I realize that for other parts of the country, these prices might sound like chump change, but consider who Maine’s largest employer is: Hannaford Supermarket. Certainly, some people at the top make a good salary, but most of the people working for Hannaford don’t make a living wage. Most of them aren’t even technically working full time and therefore don’t receive benefits. This is a weighty topic. A good thing, then, on Tuesday, that we had apple muffins on Tuesday to sweeten the conversation. 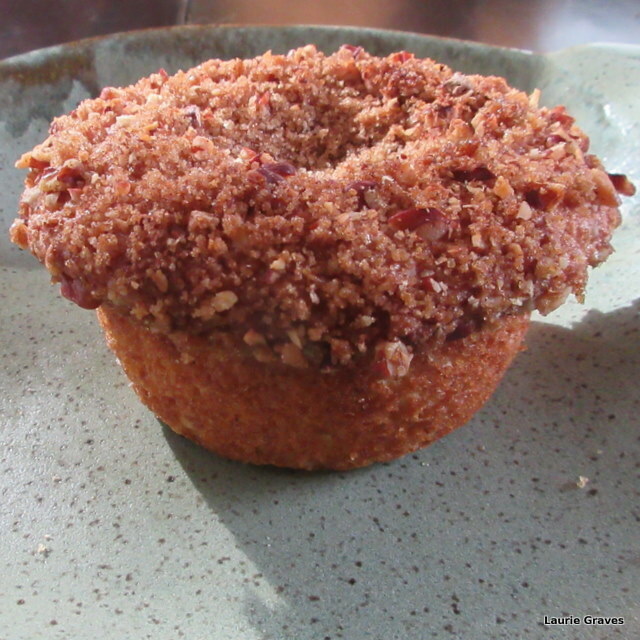 These muffins have a nut-crumb topping that would be good on almost any muffin, say, blueberry or pumpkin or banana. Preheat oven to 400 degrees and grease the muffin tin. This recipe will make either 12 regular sized muffins or 6 large muffins. In a small bowl, mix the topping—the brown sugar, pecans, and cinnamon. In another small bowl, combine the flour, baking powder, cinnamon, and salt. In a large bowl, beat the egg. Add the milk and the oil or butter. Mix well. Add the grated apple and sugar. Mix again. Add the flour mixture, stirring only until the batter is mixed. Divide the dough among the muffin cups. Sprinkle each muffin with some of the crumb-nut topping. Bake for 20 or 25 minutes or until the tops are brown. Let the muffins rest in the tin on a rack for five minutes before popping them out. Enjoy with a bit of butter, which, for this Franco-American, improves many, many things.